The Gargoyle: "Exactly. I'm glad you think of me that way." The adventures of young inventor Jean and mysterious acrobat/princess Nadia (together with baby lion King) continue, as does the pursuit of nearly everyone for the Blue Water, the jewel Nadia wears as a pendant. Precious little of the source material, 20,000 Leagues Under the Sea, remains in these four episodes of the popular anime series. Having been released by Captain Nemo from the Nautilus, the duo fly to an island that is supposedly safe, but they are shot down by a mysterious masked group of Neo-Atlanteans led by the evil Gargoyle. They run across little Marie, a small girl orphaned by the murderous Neo-Atlanteans, and spend this disc trying to avoid capture by the new villains as well as Grandis and her henchmen, while trying to find out what the Neo-Atlanteans are up to. Futuristic science, including particle beams and military satellites, continues to be an important theme, with an interesting explanation for its existence in 1889. Religious undertones make their appearance here as well, with the Neo-Atlanteans attempting to make themselves gods with their own Tower of Babel, ready to destroy the Sodom and Gomorrah of the rest of the world as some sort of whacked-out fundamentalist vengeance. Less silly than the first volume, The Dark Kingdom plays like a remake of Indiana Jones and the Temple of Doom, right down to the native populace being enslaved in a mine and the mystical-religious undertext. There are some moving moments, such as the attempts of Nadia and Jean to explain to Marie that she can't see her parents again. The feelings between Nadia and Jean deepen as well, though there is still a distance between them, best typified with the brief bit of fan service that ends with Jean getting his face slapped. Jean slyly is not above taking a bit of satisfaction in scaring Nadia with the notion of the high voltage lines that they're walking next to, an amusing touch that gives Jean a level of realism that hasn't yet been seen in the series. The comic relief of Grandis and her henchmen is still annoyingly stupid, but much more so in the English dub. The animation is quite good, with attractive visuals throughout. The scene in the blast furnace of the Neo-Atlanteans in particular is incredibly striking visually. The immobile masks of the Neo-Atlanteans vaguely resemble African tribal masks, but are nonetheless rather chilling. 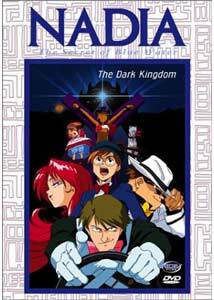 The English dub is pleasing in general, though obviously the Japanese track is preferable. Thirteen-year-old Meg Bauman does an outstanding job voicing Nadia, capturing much of the original's inflection and character. The supporting voices are less happily cast. Jean continues to have an annoyingly fake French accent, and the Gargoyle's voice is not the least menacing in the English dub, whereas he is utterly vile in the Japanese track. Image Transfer Review: The picture is quite good overall. There is some color instability noticeable at times, such as Nadia's outfit switching back and forth between vivid red and faded orange several times. A number of spots and speckles are present, but many of these are present on the animation cels themselves. This is obvious from the shots of static features that move across the screen, such as Jean's airplane, with bits of dirt and crud that follow in strict tandem with them. I suppose that this could have been cleaned up digitally, but only at a loss to the clarity of the linework. The disc is presented in a welcome RSDL format, allowing for maximum bit rate, which helps the picture immeasurably. Audio Transfer Review: Both the English and Japanese tracks are presented in 2.0. There is occasional quiet and subtle surround activity, but the program is very center-oriented. The audio is free of hiss and noise, and dialogue is clear throughout. The music has excellent range and there is good bass extension. The audio is quite pleasing indeed. Extras Review: The extras are scant. We do get the same textless opening and ending sequences that appeared on vol. 1, as well as a brief and slightly spoilerish preview of vol. 3. Two television spots for the series (with English voiceover only) are included. Wrapping up the package are brief and utterly cryptic previews of Blue Seed, Orphen, Robotech, Shadow Raiders, Arc the Lad and Monster Rancher. Nothing to get excited about. The mystery deepens and becomes more intriguing in the second volume of this popular series, and we get some good character development to boot. A nice transfer, given the somewhat iffy source material. Not much for extras, but definitely worth a look for teens.